Maryland Gov. 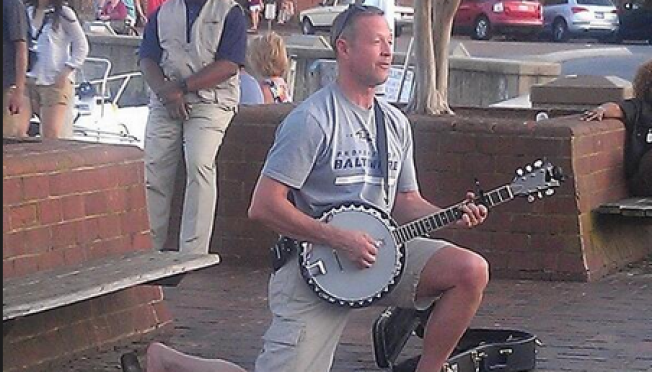 Martin O'Malley was spotted kneeling on the ground in casual attire Memorial Day, playing a banjo in Annapolis. The photo initially emerged on the @EyeOnAnnapolis Twitter account. O'Malley's Twitter account later posted the photo along with the words, "I love that as governor of MD I can still play street music in Annapolis." In the photo, O'Malley is wearing a Baltimore Ravens T-shirt, cargo shorts and flip-flops. O'Malley, a Democrat, has for years been the frontman of a Celtic rock band, O'Malley's March, where he sings and plays guitar, banjo and tin whistle. His band still plays several concerts a year.